The tourism industry in the once-sleepy town of Camalig, in Albay province, has awakened from its deep slumber. And after six years of slow development, Camalig is now on its promotion phase, trumpeting its natural tourist attractions that have started to draw visitors -- local, national and international -- from all walks of life. One of these spots that have become word-of-mouth tourist destinations in this town famous for "pinangat" is the Sumlang Lake in Barangay Sumlang, about 10 minutes from the Maharlika Highway. Since this new tourist spot can be compared to a newborn child, one visitor thought the name Sumlang is a contraction of the Filipino word for born -- sumilang. Before, Sumlang Lake was just a lake for its residents -- a source of fish for livelihood and daily consumption -- not worth visiting by any tourist. Then it was bought and developed by a private individual. 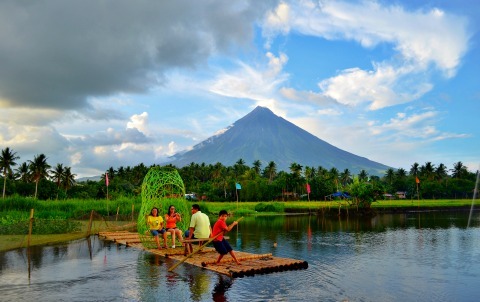 In coordination with the barangay council of Sumlang, the owner and village folk removed the lily pads, added benches and put rafts with handicraft-designed tables, chairs and shades at the lake for those who want go in the middle and enjoy the beautiful view of the majestic Mayon Volcano at the background while feeling the smooth touch of the fresh breeze. For just Php25 as entrance fee, one can relish tranquility or fun, whichever is one's choice. There are some activities one can enjoy while staying, aside from simply sightseeing and taking selfies. There is rafting or riding on a raft made of bamboo and there are tables and chairs for dining or simply chatting. For the sporty person, there is a more challenging activity -- aqua biking on a pedaled boat, which is faster than the bamboo raft. For an adventurous visitor looking for tougher activity, the kayak -- a small banana boat-like seacraft steered by a double-bladed paddle. What is more exciting is that one can go fishing since the lake is inhabited by “tilapia”, a common fresh water fish. For what it has to offer, many people are flocking to this relaxing spot. Based on the Camalig Tourism Office records from January to March 2015, the total visitors of Sumlang Lake was 171, with eight foreigners; while on April-June 015, there were over 4,000 visitors; and during the July-September quarter, there were more than 18,000 visitors.